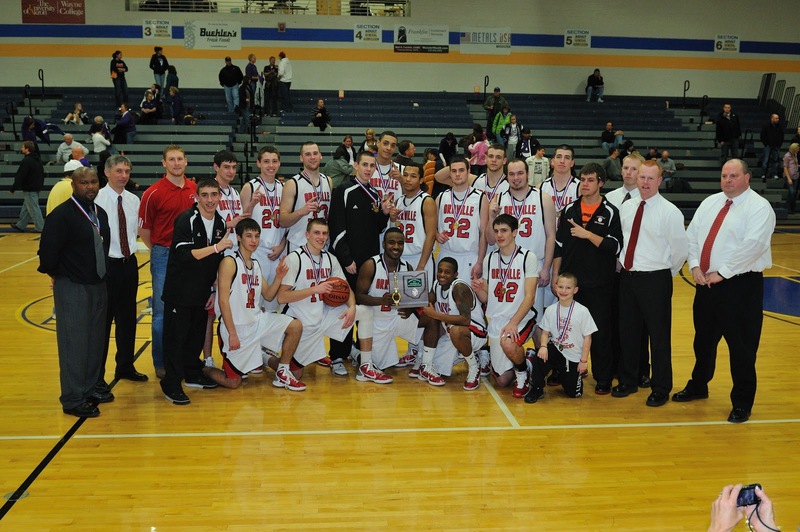 Orrville Red Rider Sports Blog: District Champs....Back to Back. Last night's 65-57 win saw a barrage of Orrville dunks by four different Rider high-flyers, and a game-high 24 points from senior Zach Wasson (now over 1,500 career points). It earned the Riders a return trip to the Canton Fieldhouse where the Riders will face Youngstown Ursuline, a 66-34 winner over Campbell Memorial last night, on Wednesday night at 6:15pm. I love the energy this team is playing with....and just a hint of swag. They're peaking at the right time. And look, the Beacon Journal was there too, and even took pictures. So nice of them. Wonder if they needed a map to get to Wooster? Great job guys, and congrats to Coach Slaughter and his staff. Has to be quite satisfying given the struggles from earlier in the season. On to Canton for another regional appearance. Pretty solid sports year so far, huh? Football made the state semifinals, volleyball made regionals, girls and boys basketball made regionals, and we had state qualifiers in swimming, cross country and wrestling......that's Red Rider Tradition.